This month’s task was all about what makes you SMILE! These every day moments from our lives that often we stop, look and SMILE about help us remain BRIGHT and happy! So this month was time to STOP and remember some of these moments. As always the first part of the task was personal and a time for reflecting what makes you smile? Do others always make me smile…do I rely on them? Is there a common theme to what makes me smile? If you’ve been following along here on my blog for any length of time, you’ll notice that I’m a pretty upbeat kind of happy person. Lots of things make me smile. Spending time with some of my friend’s kids is a sure fire way to get a smile out of me! (yahoo for newborn baby cuddles or toddler high-fives!) Seeing the sun set, or watching the northern lights dance… or just looking at the amazing world that we live in… those things make me smile. The idea of the task this month was to start focusing on what makes us smile…and not the things that bring storm clouds and downer feelings in our lives. It’s hard, I must admit… I do have ‘horrible-no-good-very-bad-days’…I’m human we all have them. But one of the things I’ve learned is that we shouldn’t focus on them…because that just starts that downward spiral to negative town…and believe me that’s not a fun place to visit! The second part of the task was to prepare a letter. I printed off 2 of the photos that my BRIGHT half posted on Instagram that made them smile, and I included one that made me smile! I also included a letter talking about 5 things that had made me smile and what this month of focusing on the positive has done to my life! 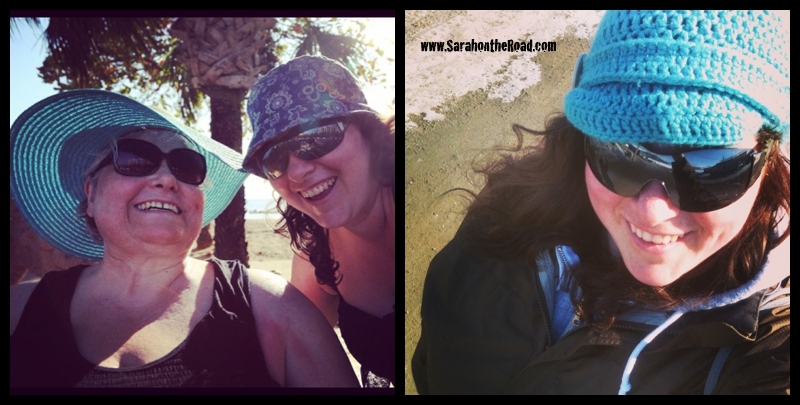 This entry was posted in Blogging Community on September 29, 2014 by Sarah on the Road. This month’s project was all about what you want in your life + your dream life. Yes, these things can differ…or you currently might be living your dream life. As always there are two parts to each task…the first part of the task is always personal. The first part had us thinking about what do I actually want from life + my dream life. Wow, that’s a deep question…it’s hard to really answer and some aspects of my life are personal and I don’t post online about, something should just be personal right? — What do I love about my life right now? — What are things that I want to change in my life? — What is holding me back from changing these things if there are any? — What does my dream life look like? — How does this relate to the word that I selected for this project? Yup, some deep questions…with some deeper answers. It was really helpful to take the time to reflect and look at where I was in my life…and if that matched up with what my dreams were. This was to think about the bigger picture…how does my word “create or creativity” fit into my dream life? One of the things I realized through this process is that there were some areas in my life I didn’t like. I wasn’t living up to my ‘dream’ of what life should be…guess what I realized that only I CAN CHANGE those aspects to get where I WANT to be. It’s pretty awesome and powerful and empowering to reflect, and realize that you aren’t where you want to be….but then to make a plan of steps to get where you want to be. Some things can be out of our control…but you can always control your ACTIONS and REACTIONS to things that happen to you. Another awesome task…unfortunately due to a mix-up, I never got a letter for this task…but this project isn’t about getting a letter in return, most of it is about the self-reflection and thinking about life! This post has been in my draft folder since April 30th, 2014. Task#4- took place from mid-March to mid-April–I’m just a wee bit behind on posting, I wanted to wait to see if I ever got a letter before posting this post, but because of the mix-up that never happened! 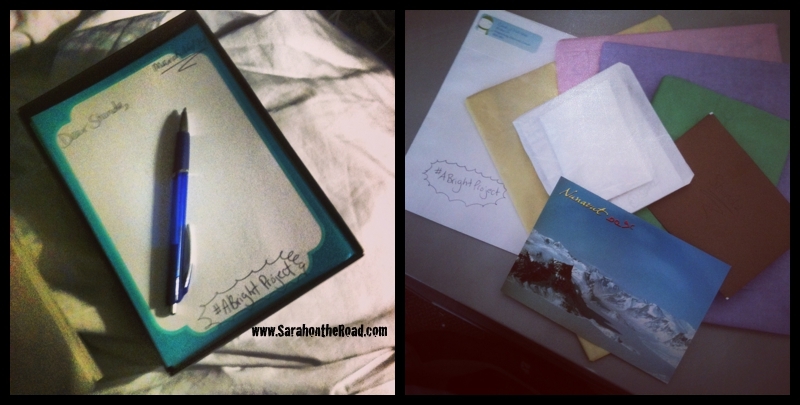 This entry was posted in Blogging Community on September 26, 2014 by Sarah on the Road. Life is just a wee bit sweeter, with chocolate! When I got home after my 2 week trip on the road I was excited to have some LOVELY packages waiting for me at the post office. (I will be writing about the others soon…) but for today will talk about the AMAZING chocolates that a friend from the #abrightproject sent me in the mail. The latest project task had us discussing 10 things that made us happy (which was shared online in our Facebook group!) Shonda who was my task#3 partner saw the discussion thread and we started talking about chocolate! 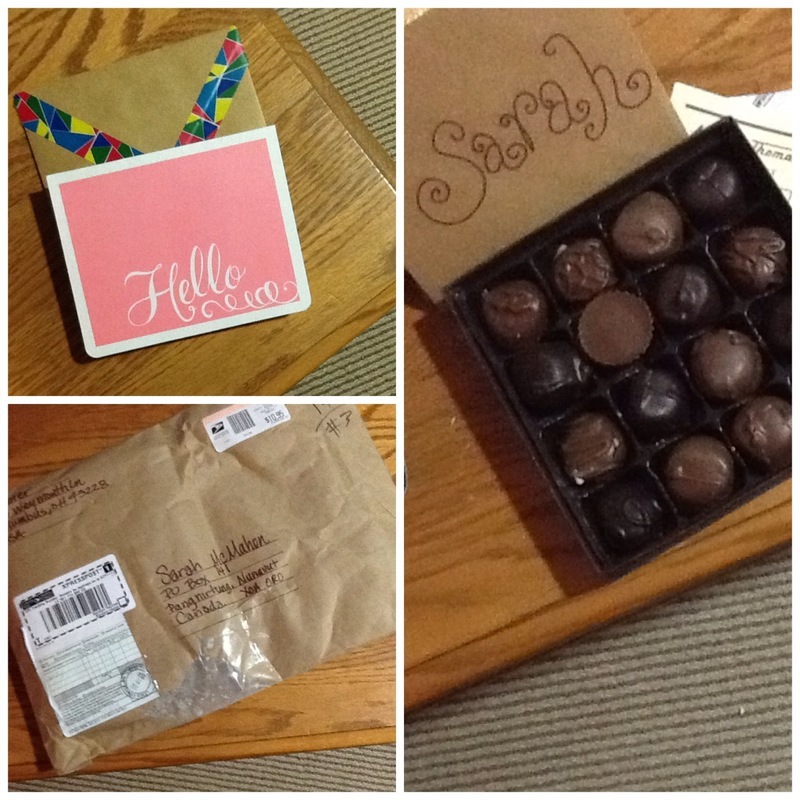 GOOD chocolate is something that I LOVE…and I was so thrilled tonight when I got home and opened up this sweet package. So here we are with Task #3 in my year challenge with #aBrightProject. This project pairs together women from around the world to create a letter and/or small parcel for each other. Each one is based on a theme to help us be as BRIGHTEST as possible. This month’s theme was all about Gratitude. The task has us self-reflecting and writing down items that we are personal grateful for. This is something my mum has always been a big fan of…I remember getting a journal from her at Christmas time and her explaining that we should write down things that we are grateful for every night before bed. I think I was 12 or 13…and I did manage to do it for awhile, but then of course those lists end…life gets busy and sometimes we loose that focus to be grateful for what we have, not what we don’t have. It was a really great month to think about all of these things…and start writing things down again! The second part of the task was the social part…which is the fun part! (see the photos above of my package!) 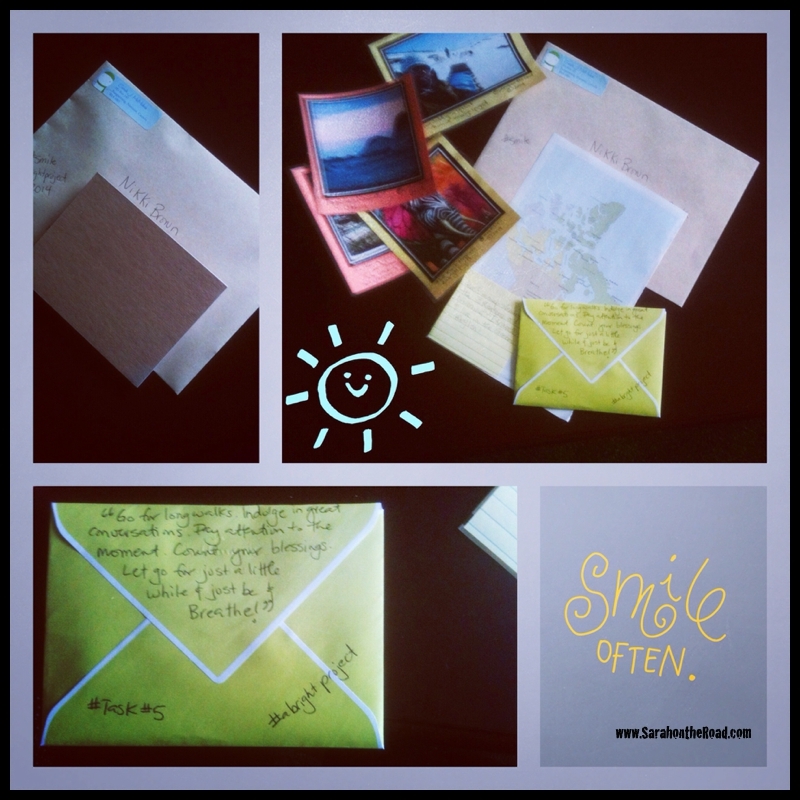 That’s when everyone in the project gets paired up to send a letter + small parcel! 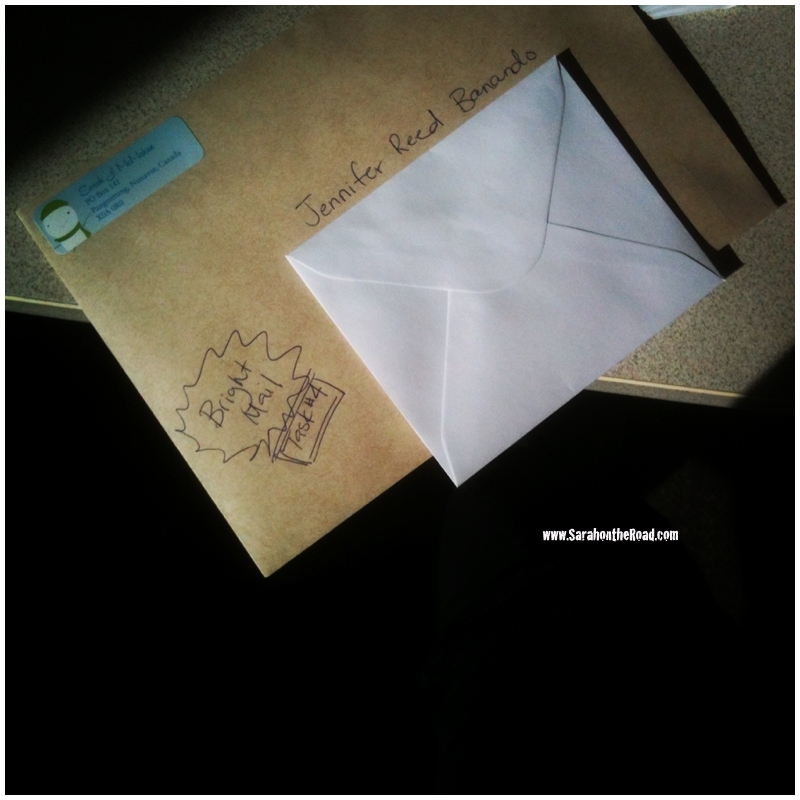 YAHOO for SNAIL mail. To remind your BRIGHT half to be grateful, as often as they feel the need, I purchased a few small things that will help them remember. I based them around the “word” my partner choose for the year and explained why I choose the items in a letter! In the letter I also talked about how my BRIGHT half could find their WORD for the year… and also included 3 things that I’m currently grateful for! I never took a photo of my items, but Shonda did and posted to Instagram once she opened them all up! Then the exciting part was to get a package in the mail…a beautiful letter from a new online-friend…it was great to ‘meet’ someone new! One of the awesome things Shonda included was the awesome stone with my word from 2014 in it… “Create”. I love it…it sits on my desk at work, under my computer monitor…as a daily reminder to be “creative” in all I do! 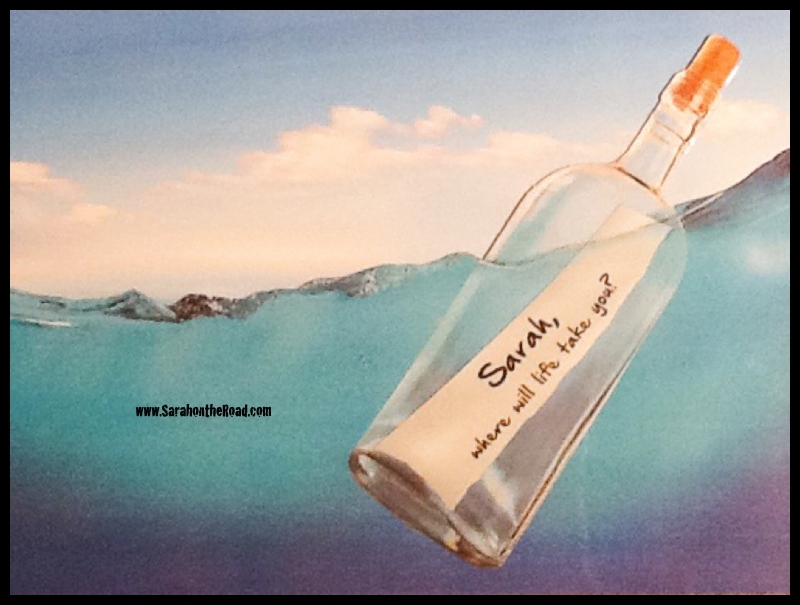 This entry was posted in Blogging Community on September 24, 2014 by Sarah on the Road. 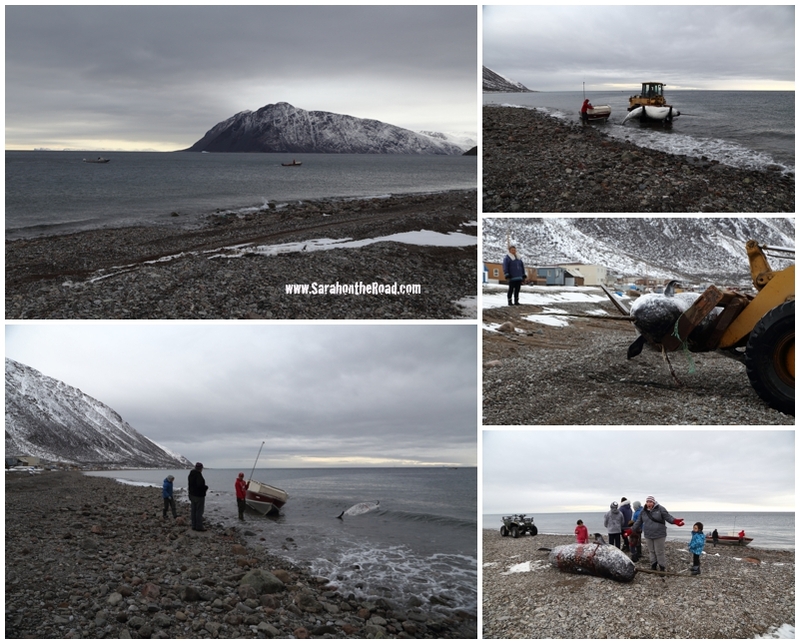 Another great day in Grise Fiord after an awesome first night (seeing a narwhal hunt)…I was excited to see what the rest of my time in Grise Fiord would bring and it didn’t disappoint. It was surprisingly warm….perfect for a bit of exploring after I got the work done I needed to get done. 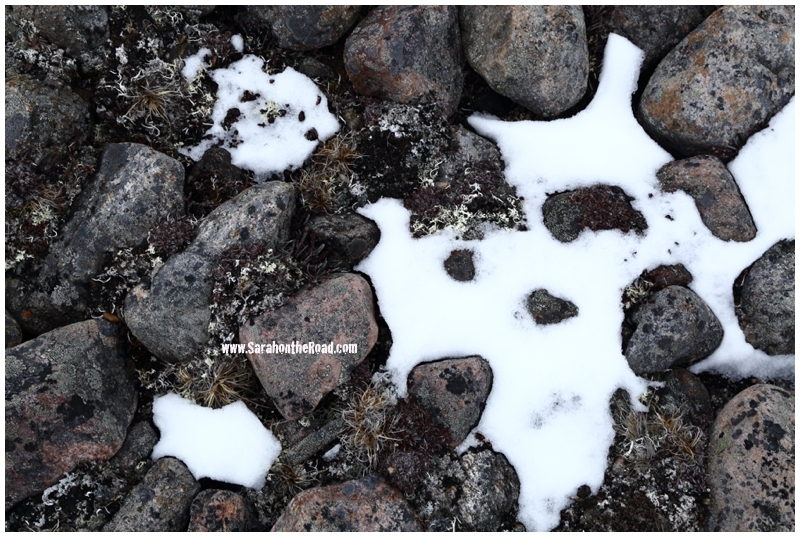 I walked up to the spot above town where a monument was erected to commemorate the relocation of 1953 and 1955 of the Inuit people. While I up there I took a series of photos to make this panorama…it’s a bit rough but I kind of like it. 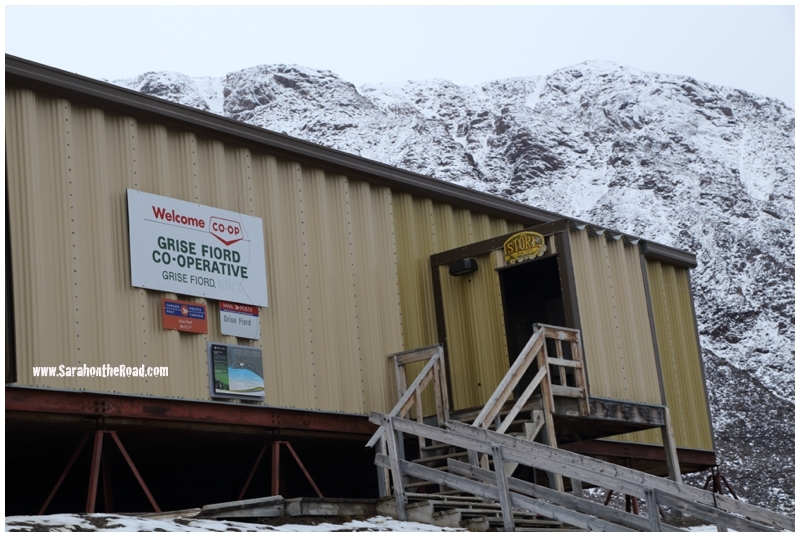 Here’s the only store in Grise Fiord…which also is the Post Office too! While walking by the Health Centre just before 5pm…two ladies brought me inside to take part in a taste testing. 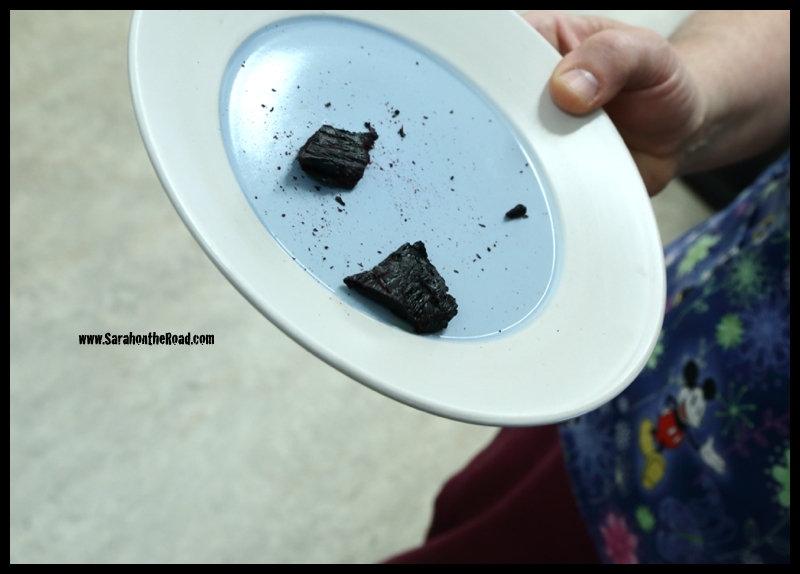 Every month they test out healthy recipes and asked me to taste their recipe of the day. It was an awesome fried rice with veggies and beef and Narwhal meat fried up in it. It was so yummy! I didn’t even stop to take a photo of it. 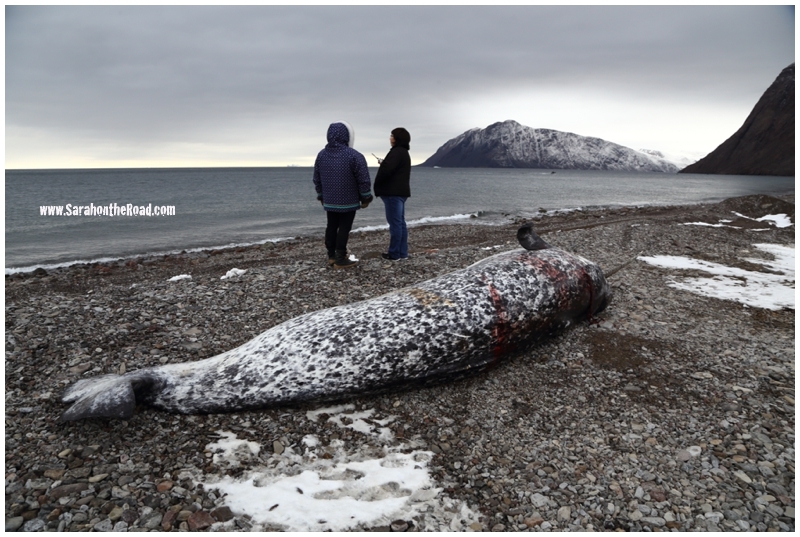 While I was there the nurse brought back some of the Narwhal meat she had already made into jerky. (picture below)…it was so yummy as well. 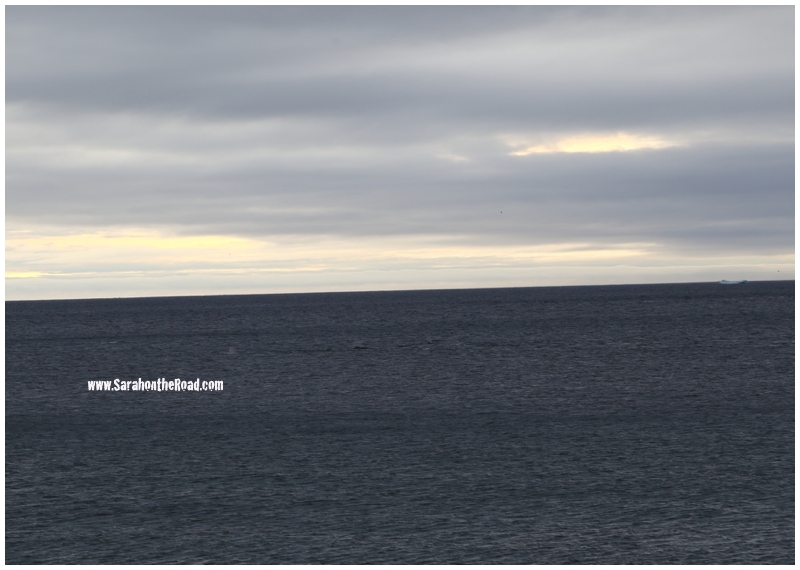 Later Friday night, I looked out the hotel windows and saw this boat. It was the Kiviuq I, a vessel that is owned by theArctic Fishery Alliance — which is made up of hunters and trappers organizations from Qikiqtarjuaq, Grise Fiord, Arctic Bay, and Resolute Bay — On this trip it was also joined by researchers from Memorial University’s Fisheries and Marine Institute doing an exploratory fishing trip around Jones sound to see the possibilities of commercial fishing. They found a possible commercial cold water shrimp stock near Grise! 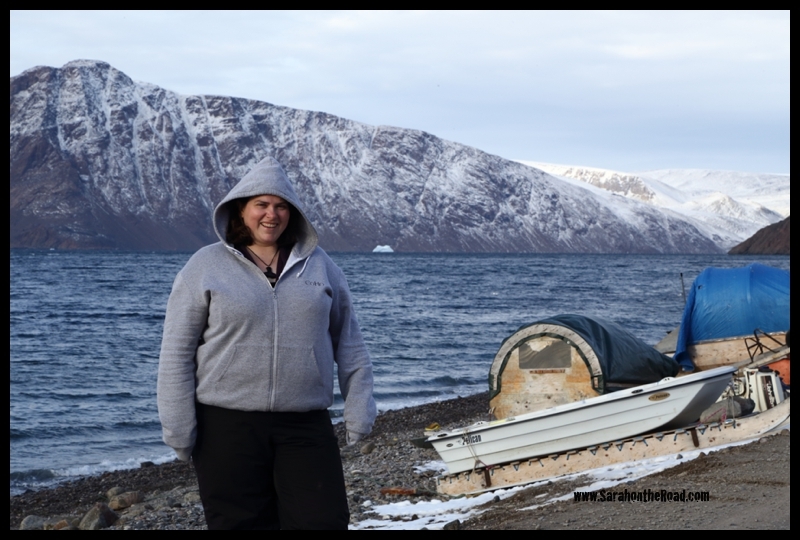 During my whole trip up in the high Arctic…I wore my CoHo Hoodie, so warm! Last Christmas it was a gift from my cousin Clayton. His company CoHo has a whole line of awesome clothing go check it out! Had to snap a photo…Clayton I bet this is the most northern location some of your clothing has been in! As we were taking the photo above…we heard the plane coming in for a landing. 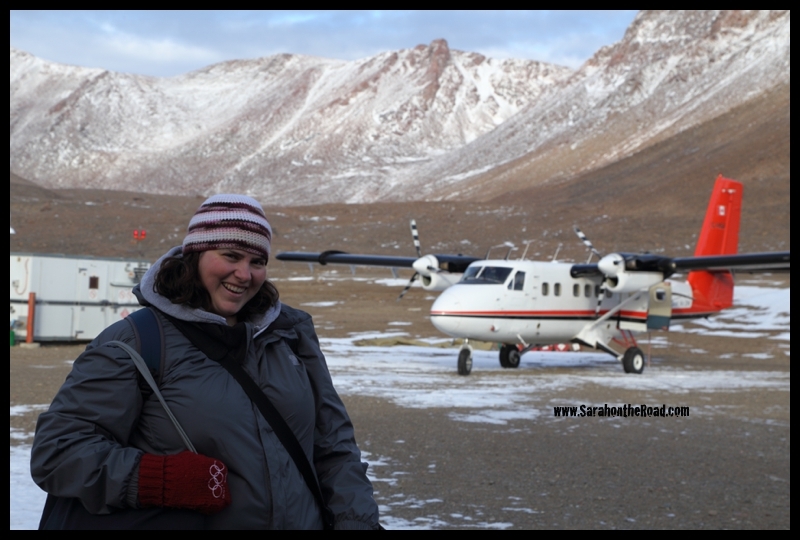 Always a happy smile when the plane is on the ground…and you are about to get on it! Especially when you are in a spot where often you go days without planes because of high wind, or other weather issues! Just some quick shots from plane…sad that my window was a bit streaky but still loved these shots from taking off and then flying over town one last time! The skating pond is already frozen over…and I’m sure snow will be coming here soon! 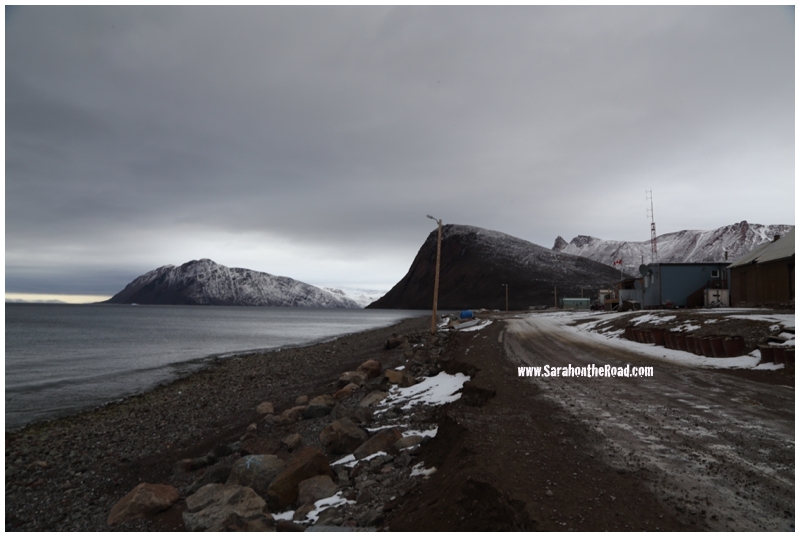 Good Bye Grise Fiord…until the next time! My flight from Grise to Resolute was uneventful. I arrived back in Resolute in time for lunch and then had one last night there. 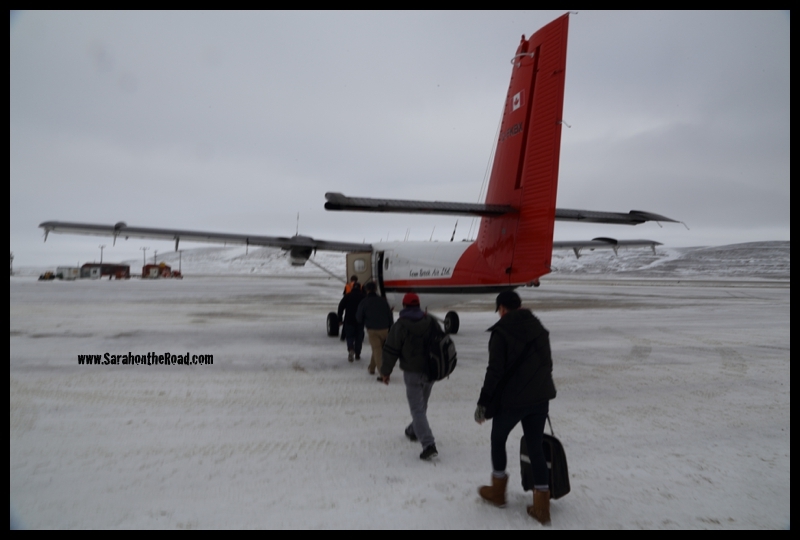 Then today I flew from Resolute stopping in Arctic Bay…with a short stop in Iqaluit before flying the final flight home to PANGNIRTUNG! I was so excited to sleep in my own bed after 2 weeks on the road…it feels great to be home. 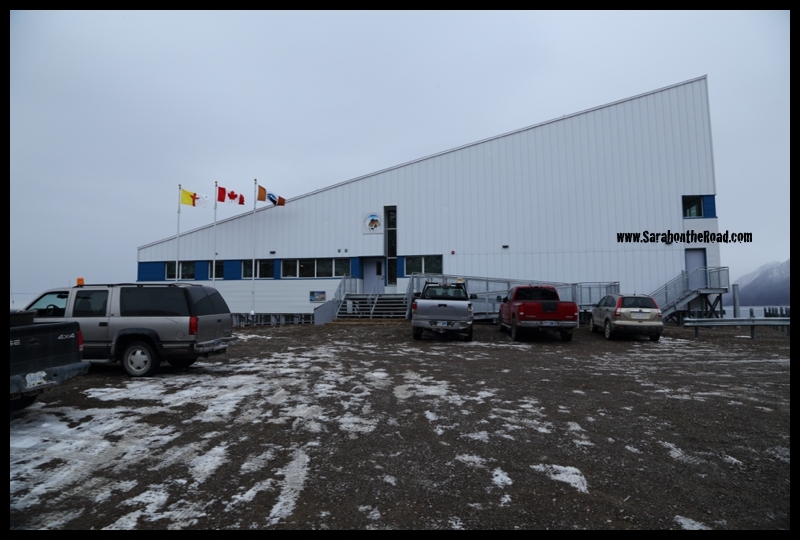 This entry was posted in Life in Nunavut on September 22, 2014 by Sarah on the Road. 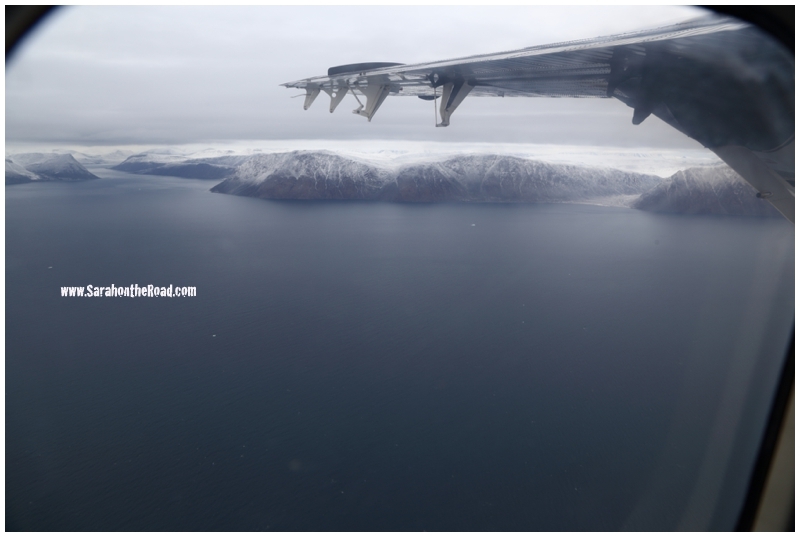 Well last week the weather was not on my side… my flights to Grise Fiord were all cancelled because of wind and snow! 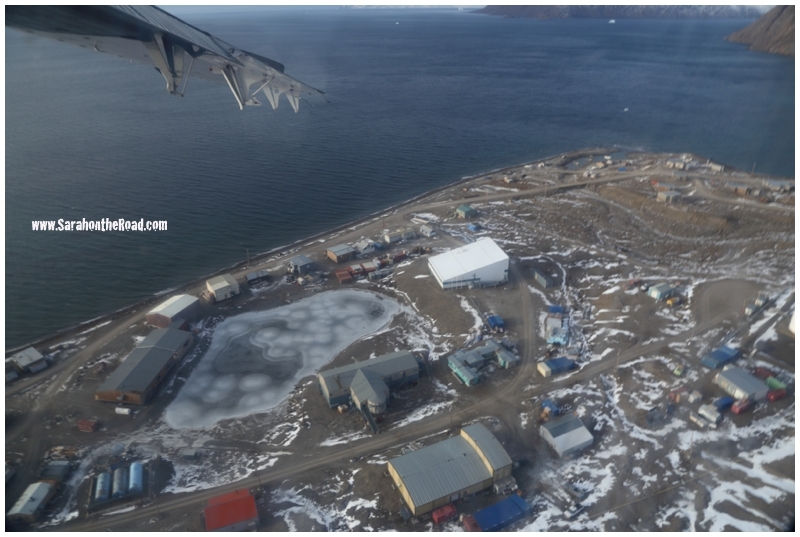 So Sunday I flew on to Arctic Bay did the work I had to do…but last night caught the flight back to Resolute to try for the 3rd time to get to Grise. 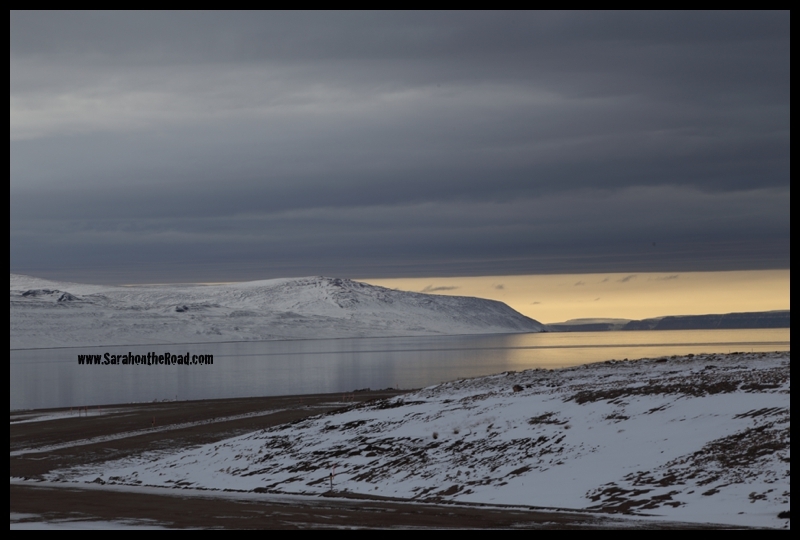 …Wednesday night, capturing the sunlight beneath the clouds before learning Arctic Bay. 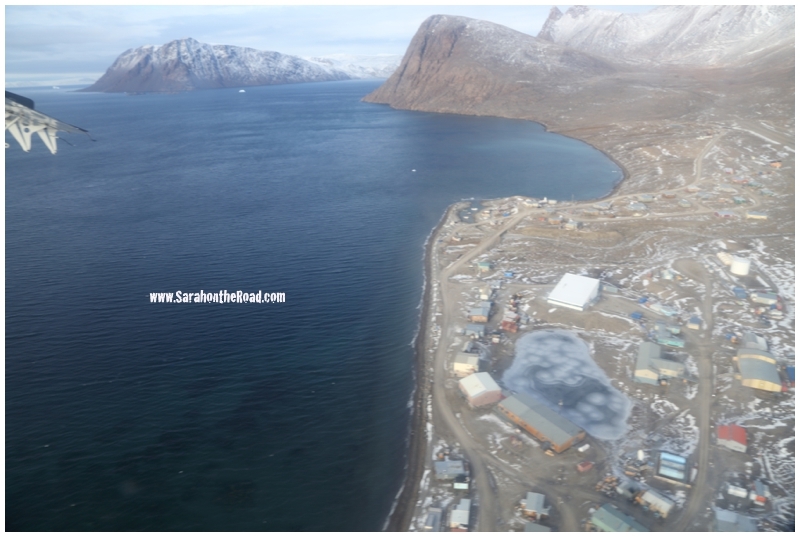 Grise Fiord also known in Inuktitut as ‘Aujuittuq’ ᐊᐅᔪᐃᑦᑐᖅ which is translated into the ‘Place that never thaws’. 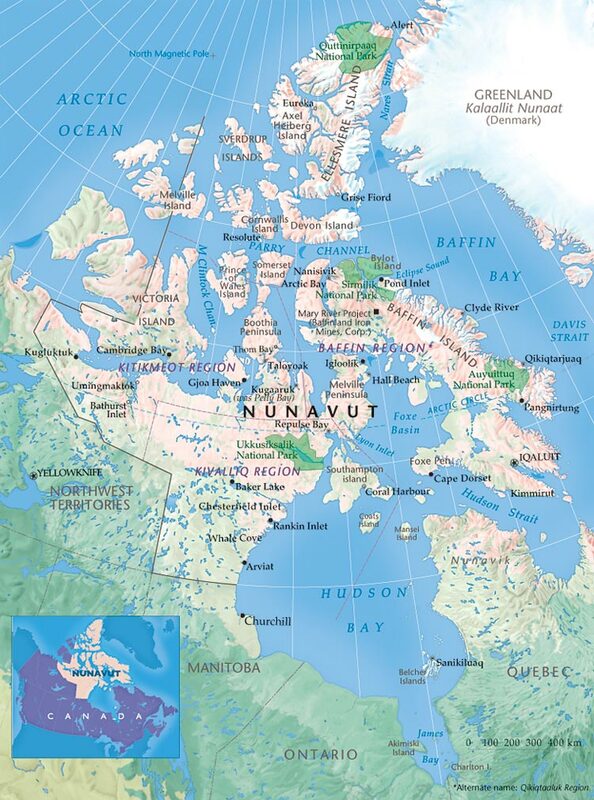 It is located at Latitude 76° 25’ N and Longitude 82° 53’ W. It’s the most northern community in Nunavut at the tip of Ellesmere Island (with a school, health centre and RCMP station!) 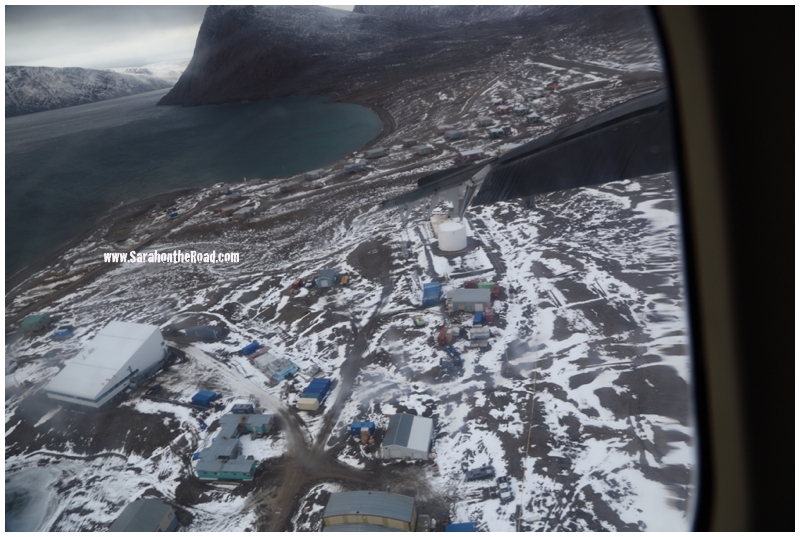 There are about 120-135 residents of Grise Fiord. 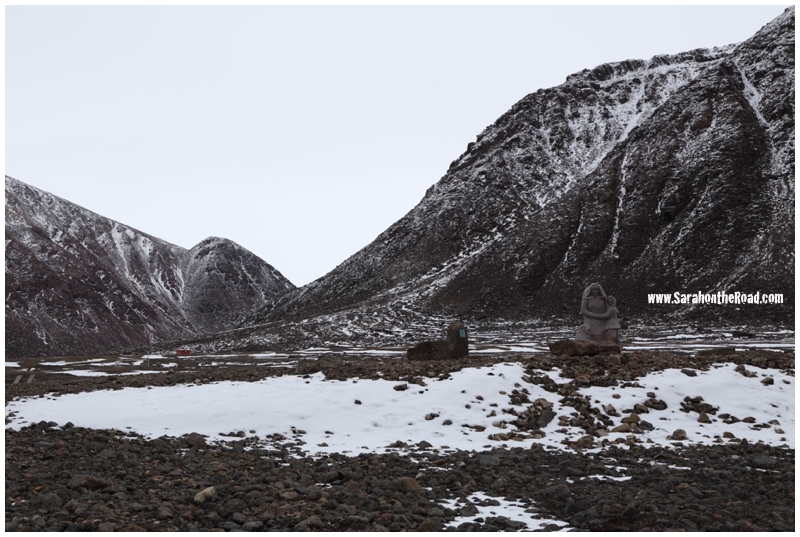 The only places further north on the map are Eureka ( small research base and refuelling spot) and Alert (army base with rotating army and scientific personnel) as well as Quttinirpaaq National Park! 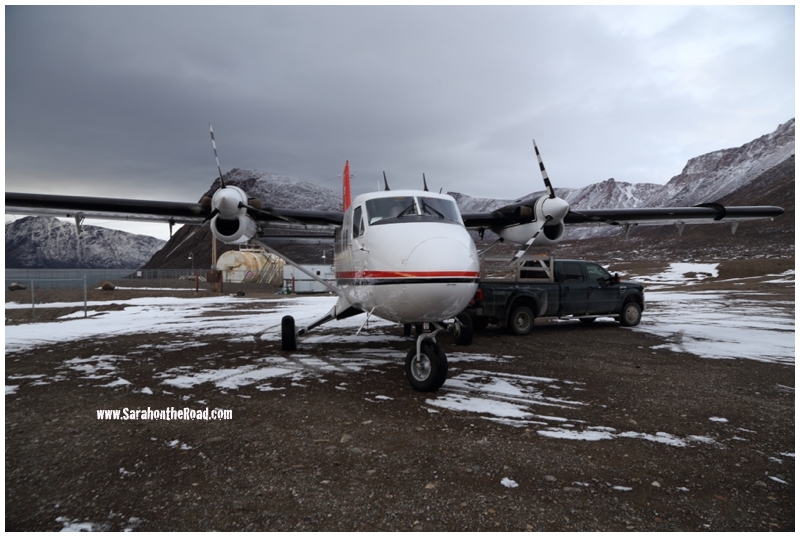 Getting there is about an hour and half flight from Resolute on a twin otter…there are only two scheduled flights a week…Thursdays and Sundays. Everyone needs to do some ‘selfies’ on a plane ride. I sat by the door..which I think is one of the best seats in the plane, but it was chilly…very drafty! I survived…and next time might wear my wind pants. 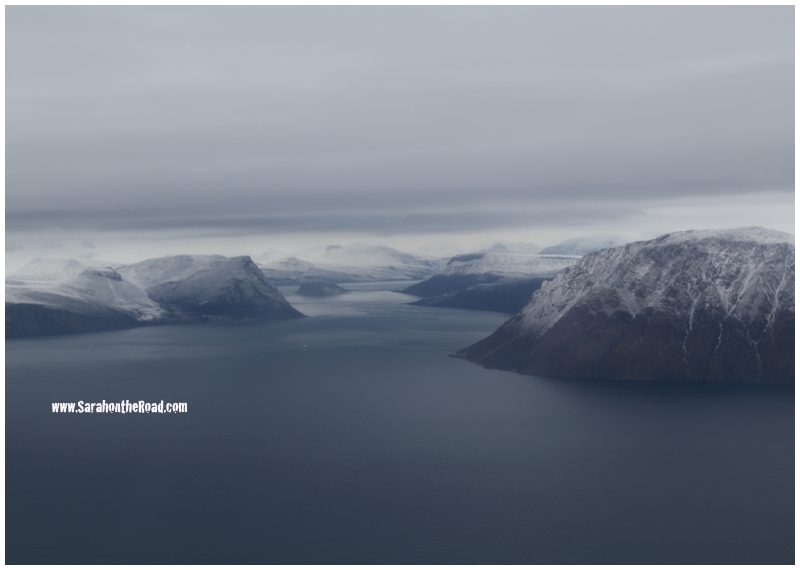 I was excited when we started getting closer to Grise Fiord to see the landscape. It will be 5 years this November since my last visit to Grise…but the dark season was already in full force…so my flights happened in the pitch black! It was so nice to see the landscape on my approach to town. Today coming in it was a bit windy…and we did dip and dive a bit on our way to the ground! Can you see the airstrip and some of the houses in the photo below on the right? It’s kind of freaky when you land…as you head straight towards this huge mountain and then turn and land on the airstrip! Safely on the ground! Living in Nunavut and flying to much…I’m so thankful for such awesome pilots…that get us safely from community to community. The plane only stops long enough to empty it’s passengers and cargo…then reload the bags and passengers and refuel. Then it’s back in the air on it’s way back to Resolute! 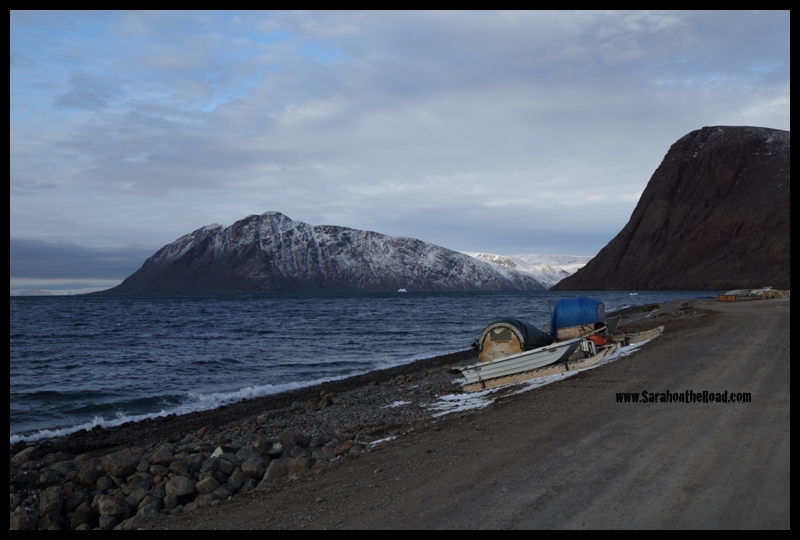 This is the road just in front of the hotel here in Grise Fiord. This little girl was carrying her puppy ‘Spotty’ home…so I asked if I could take a photo. 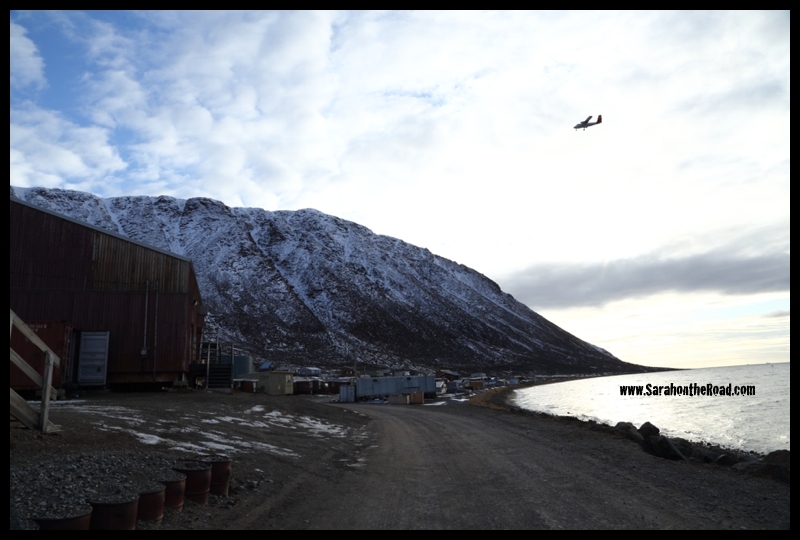 The building on the right is the hotel here in Grise Fiord. 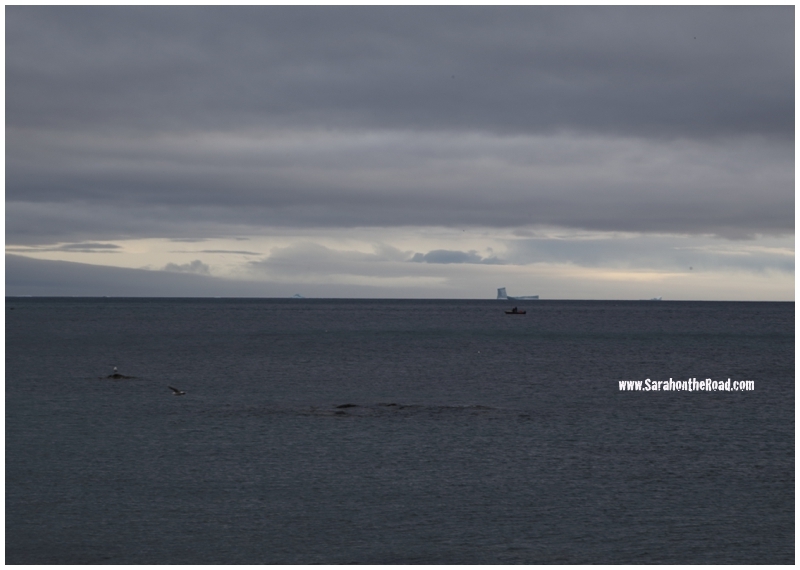 I was just making dinner at the hotel when I got a phone call (from someone I met on the plane) …that if I looked outside the windows…I might see narwhals swimming! So I quickly turned the burner off my soup…grabbed my camera and jacket and headed outside. 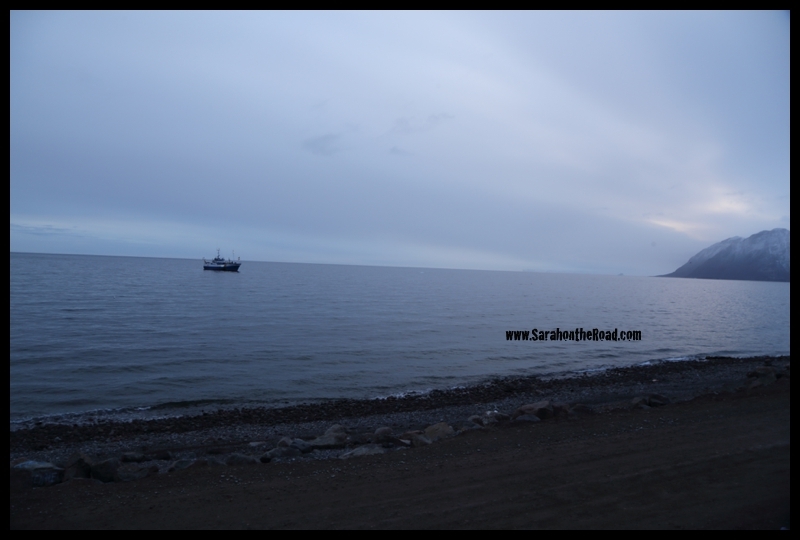 Very soon there was lots of action on the beach…with boats heading into the water to join in the hunt. I stayed around to watch the butchering it was so cool to watch the process and be able to ask questions…like the true southern I am. The man doing the butchering was ok with me asking questions and shared lots of awesome information. First they cut up the strips of the Mataaq…(so yummy–one of my favourites of all country food!) 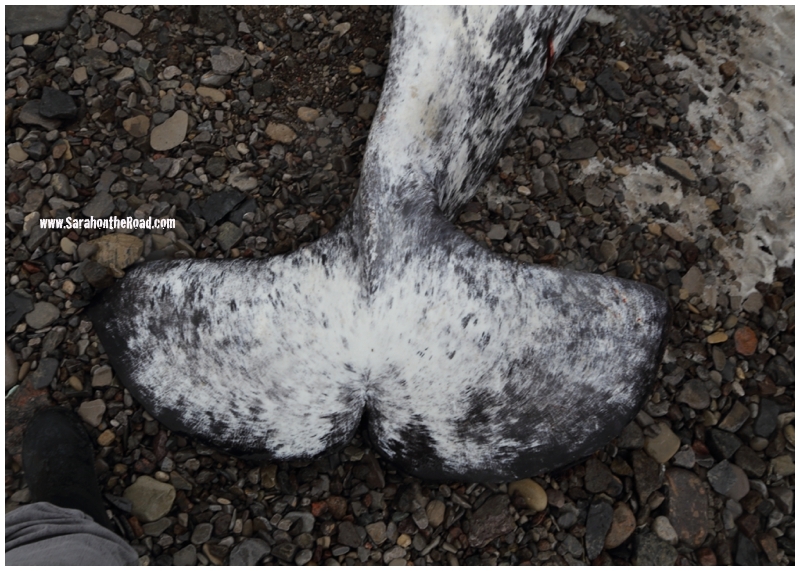 that’s the skin and a layer of the blubber. Then the meat is butchered and I was told that they will dry it and make it into jerky and use it for food all winter. This narwhal will be awesome food for lots of people tonight, and also this winter! It was exciting first to be able to actually land in Grise and get here after trying all of last week (Tuesday, Thursday, Friday and Saturday! )… and then to have Narwhal spotted AND then caught while I was here… that’s just the icing on the cake of an awesome day. 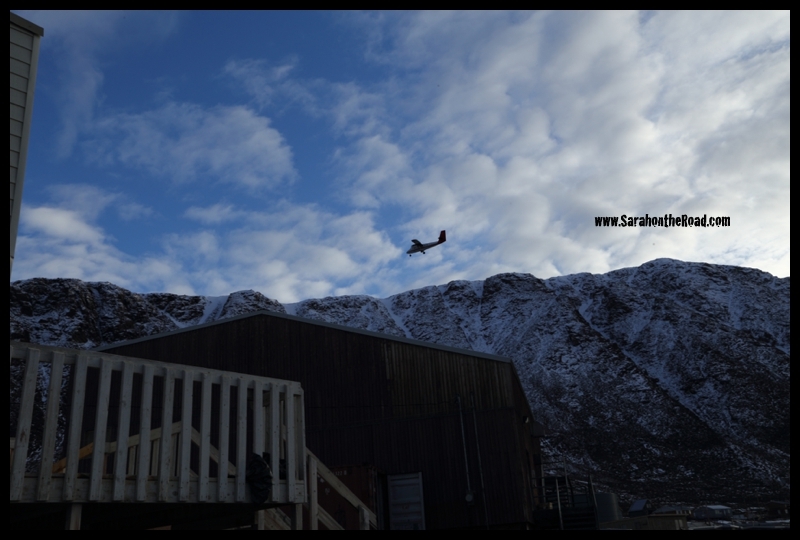 I can’t wait to see what the rest of my adventures will be like for the rest of my time here in Grise Fiord. 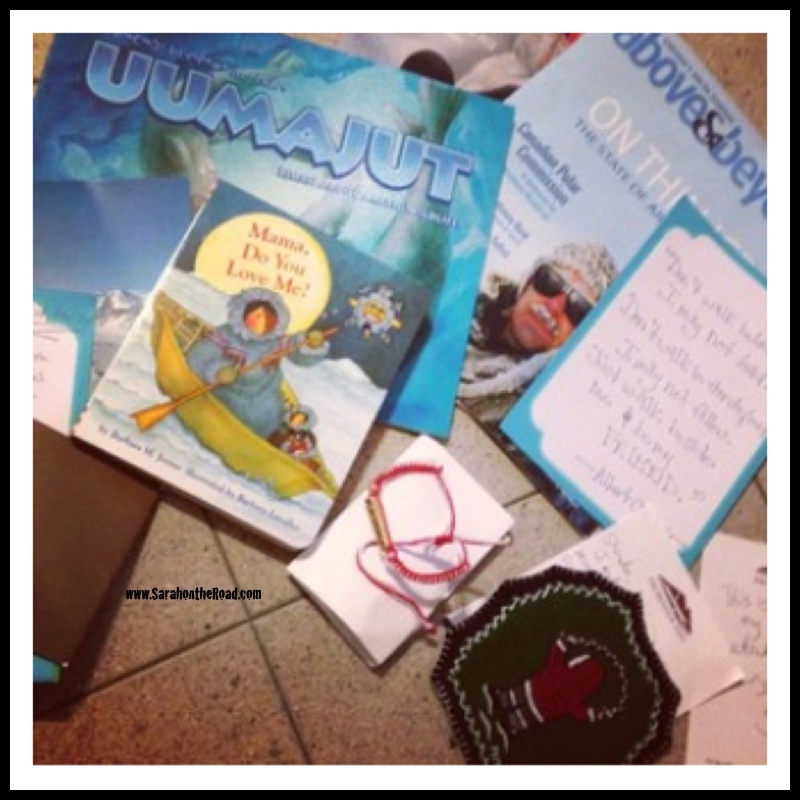 This entry was posted in Life in Nunavut on September 18, 2014 by Sarah on the Road.